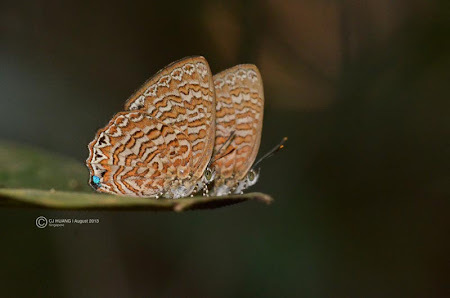 The Sumatran Gem is a forest-dependent species and is rarely found outside the sanctuary of the deep shady habitats within the nature reserves in Singapore. It is very local in distribution, although several individuals may often be seen flying together in a small area. The underside of the butterfly is predominantly brown, with dark reddish striations. Males are more often seen than females. The male tends to open and close its wings as it flits to a new perch, but then subsequently stops and stays still with its wings folded upright unless disturbed. The males are iridescent green on the upperside, with a thick black apical border, whilst the females are purple with dark reddish markings and borders. 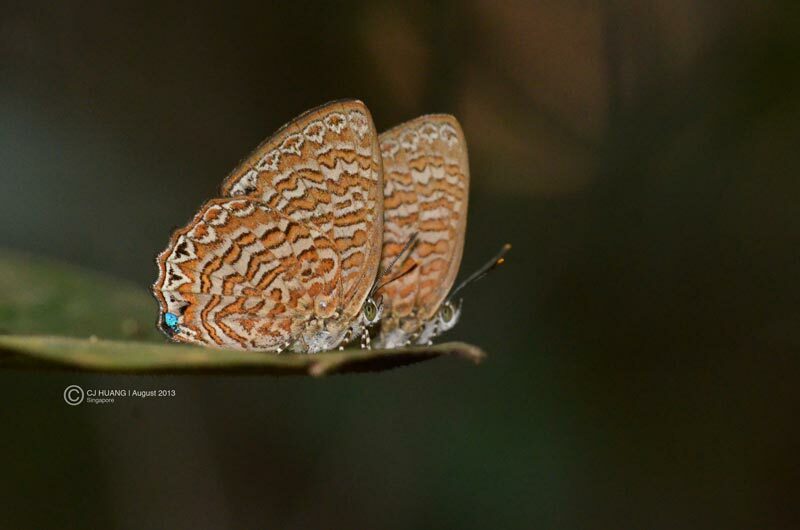 ButterflyCircle member Huang CJ encountered these two males side-by-side and got an opportunistic and unstaged shot, giving an interesting composition to this moderately rare species from the subfamily Poritiinae, of which there are only two representatives in Singapore.